Kieran McPherson and Julie Baker captured the XTERRA Victoria off-road triathlon elite titles on a beautiful day at Durrance Lake in British Columbia, Canada on Sunday, July 8, 2018. It’s the third win on the 2108 XTERRA Pan America Tour this season for McPherson, and for Baker, her second big win on the XTERRA World Tour since turning pro in 2016. Kieran McPherson and Julie Baker captured the XTERRA Victoria off-road triathlon elite titles on a beautiful day at Durrance Lake in British Columbia, Canada on Sunday, July 8, 2018. It’s the third win on the 2108 XTERRA Pan America Tour this season for McPherson, and for Baker, her second big win on the XTERRA World Tour since turning pro in 2016. In the men’s race XTERRA veteran Brent McMahon was first out of the water, with Branden Rakita and Ian King right behind. McPherson and Josiah Middaugh were a little more than two minutes behind the lead swimmers but posted the best bike splits of the day to move into the lead on the second leg. 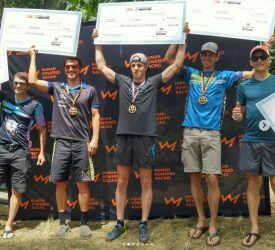 McPherson, who crashed hard on the bike and didn’t finish this race last year, proved once again that his run split is top of class on the XTERRA Pan Am Tour. He blitzed the run in 37:24, nearly two-minutes better than Middaugh to take the tape in 2:06:03, 37-seconds ahead of Josiah. Rakita finished strong in third, with McMahon in fourth and Will Ross edged out Alex Roberts and Will Kelsay by less than 30-seconds to take the fifth spot. In the women’s race Suzie Snyder celebrated her return to the dirt with the fastest swim split among elite women, but Fabiola Corona, Melanie McQuaid, and Baker all posted times within five seconds of the standard set by Snyder. On to the bike it was three-time XTERRA World Champion Melanie McQuaid doing what she does best, throwing down the fastest ride of the day in 1:17:08. The race, however, was decided on the run, with Baker posted the quickest split of day to pass McQuaid and take the tape in 2:32:52, nearly two-minutes ahead. McQuaid, who announced this race last year as she was focusing on road tri, said she was happy to see such a strong and deep elite field for XTERRA Victoria. Pan Am Tour leader Fabiola Corona finished in third, Suzie Snyder had a great season-opener to place fourth, and Katie Button rounded out the top five. With the win Kieran McPherson padded his lead in the XTERRA Pan Am Tour and now holds a commanding 127-point advantage over tour No. 2 Karsten Madson with just four races to go. In the women’s chase Fabiola Corona is now the clear No. 1 with 360 points. Kara LaPoint is close behind in second with 331 and Kelli Montgomery sits in third with 326.